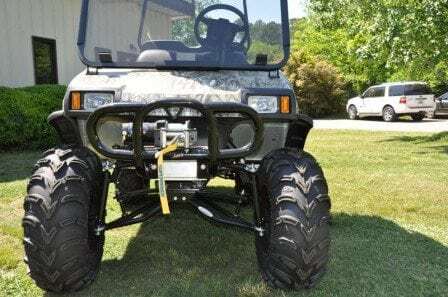 At Custom Golf Carts of Columbia we specialize in building the Custom Built Golf Cart tailored to meet all your needs. Many of our customers use golf carts in various different ways and we strive to build the specific cart that will cater to your needs and fit your style. We build custom golf carts from mild to WILD. You can hand select your Custom Built Golf Cart interior and exterior colors, wheels, lift height and any other options and accessories you can think of! We build all carts to fit various price ranges. When you custom build your very own golf cart, you select any accessories you want. This results in the Custom Built Golf Cart of your dreams and the right price to fit your budget with no add on fees or parts not needed. Our most common request for custom build is Club Car Precedent painted whatever color your prefer with Folding Rear Seat Kit, Tinted Windshield, and Light Kits. Whether it is Pink, Camo, custom blues and greens or a team color combination you want we can paint, dip or wrap your custom built golf cart. We can also add Lift Kits from 3 inches – 6 inches to allow clearance for 23 inch tires whether you need them to go through the mud or cruise the streets in style. For all venues and desires, Custom Golf Carts Columbia has the custom built golf cart for you at the guaranteed lowest price! Contact us today and speak to one of our knowledgeable Customer Service Representatives to serve all your needs!